Review | People do want to improve there their lives, but are just not willing to give up anything in order to do so. Eating healthier is fine as long as it doesn't go at the expense of its taste. Playing sports is a fine as long as it doesn't get tiresome. The same applies to cars. Many do want to go smaller, cheaper or drive more environmentally friendly, but it still needs to be as comfortable, practical and safe as a large car. This is exactly what the Toyota iQ promises though. Is the iQ able to live up to its high expectations? Most cars carry either one or maximum two passengers. Often the back seat is rarely used, but always tends to make a car larger, heavier and less economical. So the iQ offers a smarter way of living. This baby Toyota is a two-seater with substantial luggage space behind the seats. Should the rear seat be occasionally needed though, then it can easily be folded out from the load-bed. However, the legroom at the back is limited. In order to still be able to sit at the back, Toyota has made the iQ smarter rather than larger. Its dashboard has been designed in such a way that plenty of room is available for the passenger. Its glove compartment has therefore been left out. The air conditioning, which is often positioned behind the glove compartment, has been reduced in size. Therefore, the front seat can be pushed far forward whilst plenty of legroom remains in front. With a little effort it would now be possible for an adult get seated at the back. Toyota vows that the iQ is the "tiniest four-seater around", but this has been phrased somewhat too optimistically. If necessary, the iQ is able to accommodate three adults and a small child. As the iQ needs to be a worthy alternative to a larger vehicle, this sophisticated car therefore offers the luxury of a large car, which kicks off with the kit. Air conditioning, light metal alloys, leather-trimmed steering wheel, shift indicator (aids in driving economical) and a key-free access all come standard. Its more luxurious model has also been fitted with light and rain sensors, an auto-dimming rear-view mirror and climate control system. But its kit is not what makes the iQ unique. The materials used and the build quality are of an uncannily high level for such a small car. Only the display of the clock and onboard computer seem to be excess stock of the '80s. A nice example of attention to detail: the door panels have identically mirrored S-shapes, just like the tail of the car. The speakers of the audio system have been incorporated in the doors like small pieces of art. On top of that, its audio system (with MP3 and control via buttons on the steering wheel) sounds as good as it looks! But there is more to it, much more. An objection often heard is that small cars aren't to be safe. As its rear seats are literally positioned against the rear window, the iQ has also been fitted with a rear window airbag. In total the iQ has nine airbags. In addition, this smart one is made out off extra strong steel whereby even the suspension contributes to its solidity. Therefore, Toyota claims that the iQ is just as safe as many other large cars, but this has not been tried out during this test drive. The iQ has been driven though and pleasantly so! The driver has absolutely no notion of being on the move in a miniature. The iQ offers plenty comfort on bad road-surface and is remarkable placed and stable on the motorway. Besides, an electronic stability system comes in standard, so a sudden pull out movement doesn't have to end in tears. The iQ is completely at ease when in town. Its turning circle is extremely tight (7.8 meters) which allows the iQ to be astonishingly manoeuvrable. In addition its steering is very precise, making the car feel even smaller. Its all over view is slightly hampered by the thick B-pillar (a beam between the front and rear side window) which makes it harder to drive through town. Luckily the side mirrors are of a nice size. Rarely has undersigned driven through town so daringly. The iQ squeezes itself into unthinkable spaces and is able to take corners in a way that others deem impossible and therefore moves through traffic at the speed of lightning. The test car is equipped with a 1.0 litre three-cylinder engine which is one cylinder less than usual. As a rule a three-cylinder engine has a very low consumption, but this goes at the expense of its composure. However, the three-cylinder of Toyota has an exceptionally fine and smooth run. Toyota promises an average consumption of 4.3 litre per 60 miles which is pretty difficult to achieve. In town a consumption of 7 litre per 60 miles is realistic. On the motorway the iQ uses about 4.5 litre per 60 miles. Its optional "MultiDrive" automatic gearbox, changes gears slick and easy which adds considerably to its comfort. Its tiny engine is not particularly eager or alive, but does perform with a composure and dignity which are normally associated with a classy luxury car. On the motorway the iQ has no problem maintaining high cruising speeds. All the more, the iQ is remarkably quiet. Not only its engine, but also road and wind noises are barely noticeable. The iQ is much more than a manageable city car: it is also an up to par luxury car, but in pocket size. Why does someone go trough town in a huge 4x4? Because it is different and it provides a safe feeling. Why does someone drive a large executive car? Because it is comfortable and provides status. The iQ offers that same unique feeling, same safety, plenty of luxury and a superb looks. But this Toyota has managed to put it all in a smarter packaging and is therefore cheaper, more economical, and more environmental friendly. 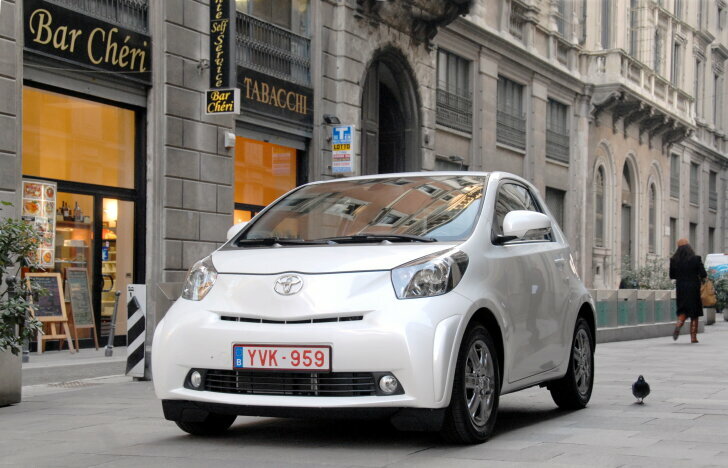 To put it in Toyota terminology: the iQ offers the comfort of an Auris, the space of a Yaris (in the front), the consumption of an Aygo and the desirability of a Lexus. Toyota has completely succeeded in its set-up and with the iQ it offers the best driving and most sophisticated small car of this moment. In short: the Toyota iQ is smarter than the rest!